Vary your K-plan deduction to see what percentage is right for you. Calculates Medicare, SDI, SUI, Cafeteria Plan and Social Security tax. A year to date printout shows your week by week earnings and deduction. Export report to Excel. Print Employee Pay Checks and pay period report. Very simple to use. There is NO better Payroll Software at this low, low price. See for yourself. Download a FREE trial and get started today. Withholding Software Thousands of satisfied customers/professionals use BREAKTRU PAYROLL© and come back year after year. Give it a FREE try and see for yourself. 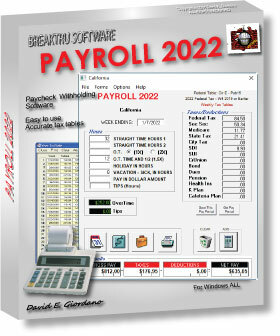 Payroll Software download from the link above. Free updates through out the payroll year. One low registration fee with NO additional monthly fee's. View on-line pdf HELP file. David, I have to say thanks a bunch for creating this Payroll software. I run a small trucking firm, I am most certainly going to register it before the price increases. I downloaded it, installed it and had it up and running payroll in no time. Dave, I received your instructions and successfully downloaded the program and it works as advertised. What a wonderfully simple way to accomplish a task that I have spent hundreds of dollars and hours of time on. I will recommend your program to my associates. I Have Reviewed Numerous Payroll Software And This Is The Best So Far And Most Reasonably Priced. Not Only Will I Purchase This But Will Make Sure All My Business Friends Hear About This. Dave, Great product for the price, searched all over the web for a do-it-yourself payroll software and your Payroll software suits my needs.